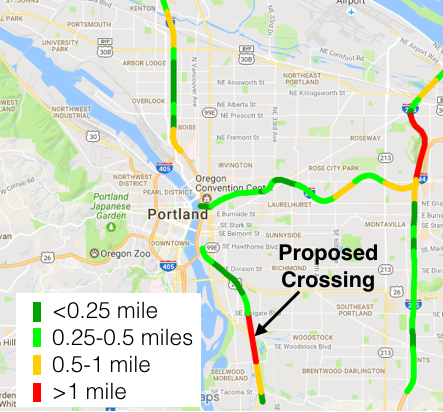 Six neighborhood associations in southeast Portland have come together to lobby for construction of a new bridge that would close a glaring gap between Sellwood and Westmoreland near Reed College. 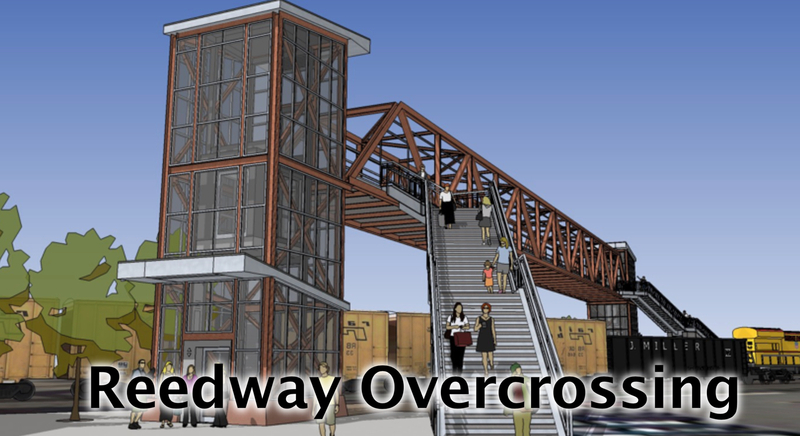 The Reedway Overcrossing would rise up from SE Reedway Street at 23rd, go over the Brooklyn Railyard and McLoughlin Blvd (Hwy 99E) and then connect to 26th. The location of this bridge would be about 1.5 miles south of the Gideon Street – Brooklyn overcrossing TriMet plans to complete by mid-2019. And there’s good news: the City of Portland has placed the project on their Transportation System Development Charge (TSDC) priority list. Given the rapid pace of development in adjacent neighborhoods (an estimated 1,200 residential units are in the development pipeline), the TSDC program is slated to fund 100 percent of the estimated $5 million to complete the bridge. Map from neighborhood advocates cleverly shows the existing gap. 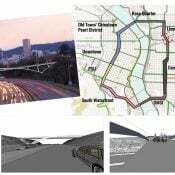 With construction green-lighted for the new bridge at Gideon as well as a new carfree bridge at NE 7th over I-84 and at NW Flanders over I-405, neighbors say it’s “only a matter of fairness” to move ahead with the Reedway project too. The project is currently on the 1-10 year TSDC priority list. Neighborhood groups are encouraging their members to testify in support of this project when Council acts to adopt an update of the TSDC list on September 13th. Never miss a story. Receive our daily headlines via email. Just to be clear: this project has no design yet – no one has determined whether ramps will or will not be included at this point. Part of the hope hear is that TSDC funds could be used to start the design process, so input from ramp advocates will soon be warranted! The website confusingly shows a rendering of Lafayette crossing, which does not include ramps. I’ll make sure the website gets updated to clarify this. Perhaps the best way to accomplish your idea would be for the City / investors to rethink this opportunity by having future development to build up the grade on both sides so as to be a more natural “bridge” than just a zig zagging maze of single use ramps. The future will be human powered. Never too late to start building infrastructure to facilitate that. Or let me rephrase that. It is still not too late. At some point in our lifetimes it will be too late, because we’ll all be walking and biking down the center of all streets and roads since the automobiles dried up and blew away, or rather are rusting with empty gas tanks by the sides of the roads and in enormous piles on the edges of town because the demand for scrap steel also dried up and blew away. It would be useful, but to realize that you’d need a way to melt it. We’ve pretty much forgotten how to do that without fossil fuels. Isn’t it the other way around? Seems like most modern smelting and metal forming processes use induction furnaces powered by electricity (better temperature and process controls, reduced heat, fewer contaminants, etc). Granted a lot of places still depend on “dinosaur farts” (thanks Yehuda) to produce electricity, but that will have to change as those fuel sources run out. Either that or we’ll have to give up the internet and television. yes. fossil fueled power plants that generate electricity that melt iron. Do you know of another method? If we wait to build that other process it is probably not going to happen. It takes lots and lots of fossil fuels to build anything these days. Out in the Columbia gorge, it was hydro-power that lit up the aluminum plants until global competition (and lots of other issues) moved that industry overseas. Of course, hydro stood on the shoulders of petroleum to get all that concrete in place on the Columbia, but that’s largely due to our historical and on-going dependence on fossil fuels. Solar and wind power have the same rotted legacy and will retain it for a long time. If we ever break the dependency on fossil fuels (and manage to survive) it will be generations before people can point at something and say “no petroleum went into making that.” Even then, I expect we’ll still wrestle with environmental concerns. None of the alternate energy and materials sources are free of environmental side-effects. The underlying model of consumption isn’t particularly sustainable. Huh. For an extra 1c/kWh or so, I had 100% renewable (mostly hydro and wind, with a bit of geothermal) power delivered to my house in Portland. Those sources will still work in a post-fossil world. That 1 cent surcharge is a trick. It doesn’t scale. If we wanted to scale up renewables to the point where we could power EVs and build factories with renewable electricity we’d find ourselves surprised that our CO2 emissions would rise even more quickly than they do now due to the capital requirements of that buildout. And the lifetime of the capital is relatively short, to the point where it isn’t clear that we ever get ahead of the game. That’s my point in speaking of it as a rotted legacy. We have dug and continue to dig a very deep hole. It’s going to take a long time to climb out, if we can climb out at all. If you want to visualize the crossing, just read the article text. I had no trouble with that. If you want to doubt yourself, read the text and *then* look at the map. It’s a misleading annotation over depictions I can’t make sense of. Isn’t there already a bridge just like that… umm, further north? I stumbled on it once, and it was quite cool. where’s the ramp to access the bridge? why do they keep making these things unfriendly to strollers, mobility devices, and bikes? the depiction shows an elevator. Ramps have to be 8% or less in slope, or have level landings every couple hundred feet. They end up being quite long and expensive. Ok if you’re on a bike. Not so much pushing a stroller or wheelchair. How can PBOT/TriMet/etc. make sure their elevators are reliable? If someone in a wheelchair is depending on them working, and they’re out of service for a month, what does that person do? A long ramp is far superior to a staircase if one is using a wheelchair or pushing a stroller. Elevators are frequently broken and require entering an enclosed space, not an ideal safety consideration. They don’t call it the Failing Bridge because its ADA ramps are constantly out of order like the Lafayette and Gibbs elevators. Another bridge with an elevator is that tired definition of insanity, and connecting the Morelands in the name of “equity” is a word that would be censored here. I’m not against this thing, I just want honesty and reliability. This will see use from residents of all of southern SE, not just the Morelands. I too would love to see a ramp design though. My home and that bridge are almost exactly the same distance from city hall. It’s hardly living in the Morelands, but “inequity” still isn’t the first word that comes to mind. It’s clearly labeled the Failing St. Ped Bridge over I-5 in N. Portland. Not terribly bike friendly. It needs ramps instead of elevators. Also, the stairs look too steep to carry a bike up. If PBOT won’t build a ramp, they should at least make the stairs less steep and put the bike gutter in the middle, rather than along the railing where it’s vutually unusable. You should try such ramps in an unpowered wheel chair. And you should try the stairs in a wheelchair when the elevator is broken down for months at a time. You should try the alternative in an unpowered wheelchair. A ramp is more reliable than an elevator and far less daunting than the status quo on Bybee or Holgate—if you can even get to them from anywhere near Reedway. About time! However, it’s worth noting that Tri-Met wouldn’t build the Harold St. station and the ped/bike bridge connecting residences on the west side of 99E with the station site and Reed College because they thought the area wasn’t developed enough to warrant it (and they claimed that the one minute delay for a train stop at that location would have made Max less attractive to Clackamas Co. commuters, a claim they still stick to). No elevators! They will be the first to give out when there are slight tremors, much less “the big one”. 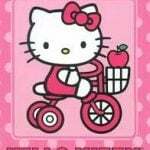 We will need bikes when the electrical grid goes down for whatever reason and trimet is crippled, and all yourSOVs are hopelessly gridlocked because no traffic signals.! Under those conditions you can just walk across the tracks…. The Americans with Disabilities Act is a Civil Rights law. You can’t build a pedestrian facility that does not accommodate all users. Did you mean to say – you can’t build one that doesn’t very poorly and intermittently accommodates all users? The ramp on the south side of the Sunset Transit Center pedestrian bridge seems pretty effective. It carries a lot of humans and I’ve never seen it ‘out of order’. except for the Waud Bluff Trail? 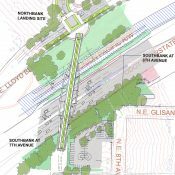 Hopefully the bridge will also provide a way to access the future trail planned between McLoughlin and the MAX tracks. That could be accomplished by either a further set of stairs/elevators/ramps, or a signalized at-grade crossing of McLoughlin. When built that trail will provide area residents with a great connection to the Springwater Trail, Downtown Milwaukie and the Trolley Trail. I live close by and this grinds my gears so much. First of all, there’s no way it will only cost $5M. The Gideon St bridge is estimated to cost $10M, so the Reedway bridge will likely cost even more considering that it has to cross Hwy 99 in addition to the Union Pacific and Max train tracks. Secondly, the east side landing is barren. There’s really nothing worth walking or biking to. The destinations cited (Reed college and Crystal Springs) are more easily accessed by Bybee or Holgate for 95% of residents on the west side of the tracks. I just don’t see the flood of people who dread their 1.7mi commute that would warrant spending $10M+ on this bridge when there are so many other worth projects. FYI, the similarly specified Lafayette bridge cost $3.9 million to build. As a data point. 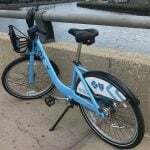 Have you tried riding a bike on Bybee or Holgate? The former is harrowing, and the latter is flat out suicidal. I’ve ridden both hundreds of times. Never noticed any problems. Right? The Holgate bridge over the rail yards is one of our best examples of bike infrastructure — subtle and understated, with just a hint of blackberries. & ripe this time of year – a surprise bonus, just for us who eschew the auto. Only ever on the sidewalk and even then it’s not pleasant. Frequently. There is nothing remarkable about riding either street. I don’t know about getting that whole lane to yourself. Bottom line is that there are no dedicated bike facilities on Holgate and the cars do move quite quickly (sidewalk gets a little narrow at points too). At least Bybee has a bike lane. It’s all about access to Gigantic Brewing. Thanks for the Press Jonathan! We are pushing for this project, which having the Federal orange line funds open up to build the Gideon Overpass, makes much more likely as more development funds are freed up. I have spoken adamently about the needs for ramps, and will fight hard for them. This is is biggest safe connectivity gap in Se Uplift as it is 1.7 miles from the narrow ByBee bike lanes the double elevator…..and we all know how well that worked out last winter. I do think the $5 million TSP is grossly underestimating the cost. I will be speaking on behalf of this overpass, and the six neighborhoods and Se Uplift endorsed 60s bikeway at city council. Autocorrect on my new phone put my full first name in there….ignore it please. I have spoken adamently about the need for ramps, and will fight hard for them. This is is biggest connectivity gap in Se Uplift as it is 1.7 miles from the narrow ByBee bike lanes to the double elevator…..and we all know how well that worked out last winter. I look forward to this and the Gideon bridge. I wish getting to Oaks Bottom would be improved. 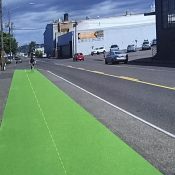 Even if you cross the future Reedway bridge, you still have to deal with Milwaukie Ave, and the part in front of Oaks Bottom is one of my least favorite. There’s often a seemingly endless stream of people coming off of McLoughlin, the sea of asphalt at Milwaukie and Mitchell is not an inviting place to walk, and good luck getting anybody to stop for you while crossing Milwaukie Ave. The difference in crosswalk compliance on the same road between Brooklyn (terrible) and Sellwood (could be much worse) is incredible. Good news! This difficult intersection will soon be improved for people walking and biking. An painted crossing, separated bike lane, refuge island and rapid flash beacon will be added. The project has been delayed for years, but last I heard it has gone out to bid and should (hopefully) be installed this summer. Here’s the design (more or less, there may have been some tweaks). Thanks for posting this. I’m glad to know someone is paying attention to that intersection. I have mixed feelings on what I see but I’ll leave my pitchfork in the closet until I see the final plan. I road past yesterday, still no activity. Please, if you can check with the project manager in the status of this. If there are anymore delays, contact me as we can go through the advocacy process. This has been delayed since the Adam’s administration. I will go to bat for it. I never had much trouble on the Bybee after it was redone a few years ago, but Holgate sucked. Having lived in Brooklyn, that was my main connection to Woodstock, Creston and everywhere east of there. I have never, ever ridden the bridge deck on Holgate, though, and always took the sidewalk. On the west side of the bridge there are signposts that make the path too narrow, and on the east side there are several blind corners for sidewalk riders. If this proposed bridge had been there, I would have used it a LOT as an alternative to Holgate. I would still ride Holgate to get to anywhere between Powell and Steele, but this new bridge would have been a far better way to Woodstock. They really need to add just a bit more realism. Clouds in the sky, rain, homeless, yellow stains and oh yeah, an “out of order” sign on the elevator. What is it with Portland and their stop signs on round abouts and their fascination with stairs…WHICH EVERYBODY HATES. I would really love to be in the elevator business. These infrastructure installs come with endless expensive and elaborate maintenance regimens, delicate electronics prone to failure and abysmally slow service even when running as it would likely be a hydraulic type. How these types of crossings pass as acceptable is just laziness on the part of designers. How often are parking garage elevators out of order? I really don’t know, but I’ve never experienced that. If an elevator must be used, can we get one that doesn’t break down as frequently as other pedestrian bridge elevators? There are several configurations of ropes and pulleys that would make it easy enough to lift even a metal cage with a fully-loaded cargo bike—would that be more reliable? Or, I know—what Adam said about gutters built into the stairway that aren’t blocked by railings! Or a ramp. Something. We seem to start by planning for an easy, push-button experience, but then end up with the worst of all possible worlds when the button-pushing doesn’t do anything. Then there’s no ramp, no [usable] wheel gutters—just stairs. 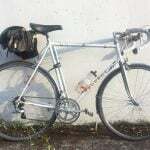 Works for me with my commutified ‘cross bike and a couple of panniers to carry, but anybody much older, much [,much…much] younger or with a much heavier (or longer) bike is out of luck. But I guess it’s no big deal if it’s just a bike route that’s out of order; it’s only a couple mile detour, right? What’s that, only 15 extra minutes? Try telling motorists it’ll unexpectedly be 15 extra minutes to drive to their destinations. At the very least, can we just have two buttons for the elevator? Why on earth does the Lafayette elevator need so many buttons? “Go” and “Pause” is all that’s warranted. Has anyone ever actually been confused as to which floor they’re currently on and which one they’re heading to? Me, but that’s all the more reason for a simple “Go” button. Or perhaps “take me to the other one”? good idea. On the one hand, a bike/ped bridge here would be nice, and avoiding a 1.7 mile detour will save about 7 to 10 minutes for a bike rider. On the other hand, $10 million or more can fund quite a bit of bike infrastructure elsewhere. I don’t know if funding sources make this an either/or decision. Do we have that choice? To be realistic, TSDC funds will most likely be used for matching funds for a Connect Oregon or other such grant that will minimally pay 50% of the cost. This is a needed, but high cost, piece of infrastructure. Let’s build bike stuff in neighborhoods that clearly lack greenways. If we are indeed talking about the collapse of the energy economy as you’ve been preaching, my point is that we will at least still have the base capacity of today’s wind and hydropower to work with. Multiple gigawatts will still be available to smelt bike frames. Well except that there will (in this hypothetical scenario) be just a few competing demands for those few measly GW, and don’t forget that to maintain that capacity we need a constant influx of fossil fuels…. Elevator and stairs (with integrated bike channel) are the bare minimum but I hope that they can design a safe ramp for people who want to keep their momentum and remain on their bicycle, stroller, etc. As single occupant vehicle use becomes less and less efficient, we should continue to push for designs that are accessible to all *AND* reinforce the message that we already know: cycling is the most efficient form of transportation. I’ll ask again – why on God’s Earth can’t we just have a tunnel?! No moving parts, much, much, much, much cheaper. Put lights in it, cameras, concessions, piped music, whatever; but don’t tell me it is not a real possibility, given how expensive and unworkable the elevated solutions have turned out to be. Building a shallow tunnel under an operating rail yard would be an interesting engineering challenge. Why do you say that? Every single German train station I think I’ve ever been in has these (or many of these). I’d think it pretty elementary and my back of the envelope guess would be 1/10 the cost; maybe 1/20th? The difficult we do right away; the impossible takes a little longer. Because the tunnels were built under the tracks while the station was being built, not under an operational rail yard. I can see that doing it after the fact could be more involved, but with the kind of technologies we’ve got now and the budget apparently under consideration I would be very surprised to learn that this wouldn’t be vastly cheaper than what is being proposed, even so. good idea, I wouldn’t think that a well-lit tunnel would be any sketchier than an elevator! I haven’t even read this article yet, but wanted to jump down to the comments to say – PLEASE LET IT HAVE RAMPS!! The Layfayette Bridge is out of service AGAIN this week. I can pick up my bike and lug it up and down the equivilent of six flights of stairs, but families with trailers, parents with strollers, and wheelchair users cannot. For the love of god…. build a bridge with RAMPS! Absolutely. We can debate the merits of elevators, but ramps are an absolute must. Both for users of bicycles who can’t carry them, and for wheelchair users when elevators fail. Awesome. Build it and I will come. Extra bonus points for a ramp mid way down to the east side of Milwaukie and a path north up to 17th from there. Like Adam.. grr pesky broken lifts again. Ramps ramps ramps..